Why You NEED Underinsured Motorist Coverage | Hupy and Abraham, S.C.
Our client was only 14 years old at the time of her accident. She was riding her bicycle in Sun Prairie, Wisconsin when a motorist made a left turn in front of her. Her injuries required multiple surgeries and hospital stays. The insurance company repeatedly denied the claim, contending that she was mostly at fault. Hupy and Abraham took the case and demanded the policy limits. When they refused, we initiated a lawsuit. Shortly before the suit was filed, the insurance company tendered its full $100,000 policy limits. 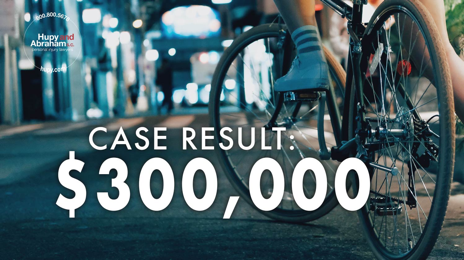 Our attorney then obtained the $200,000 limit on our client’s underinsured motorist policy, bringing the total to $300,000. The client was grateful to Hupy and Abraham for never giving up on the case.